phpWebsite is a free and open source software developed by the Electronic Student Services at Appalachian State University. phpWebsite is licensed by LGPL license. The first version of phpWebsite, version 0.7.0 was released on the 29th January, 2001.phpWebsite was written to improve the functionality of Phpnuke. In March 2002, phpWebsite was thoroughly rewritten to remove all the Phpnuke code. 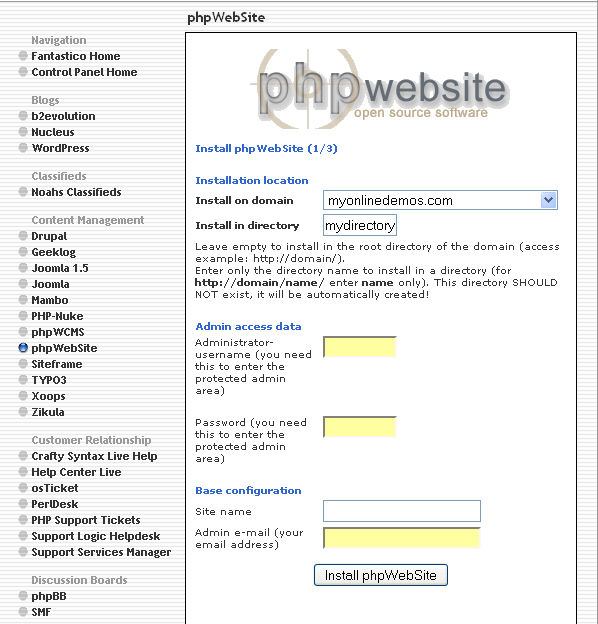 The new rewrite of phpWebsite was released on the 2nd February 2003.
phpWebsite version 0.10.0 was debuted on the 24th November. It is an improved version with new modules, themes, and features. Many of the bugs are also fixed. The development of phpWebsite 1.x started in 2003 with the core modules being rewritten so that it will run more efficiently. In November 2006, version 1.0.0 was released. The latest version of phpWebsite is 1.6.3 which was released in 2009.
phpWebSite is often used by a community group for education purposes. PhpWebsite is fully customizable to meet your needs. Administrator can install, update and change a component through the administration area. PhpWebsite include many modules such as image galleries, blogging, and message boards. PhpWebsite does not contain so many features like Word Press or PhpBB. The content creation and management tools allow users to create and maintain files, documents, images and etc. The content organization and navigation tools allow users to organize the structure of the content. The communication tools allow users to communicate with each other through email, internal message and etc. 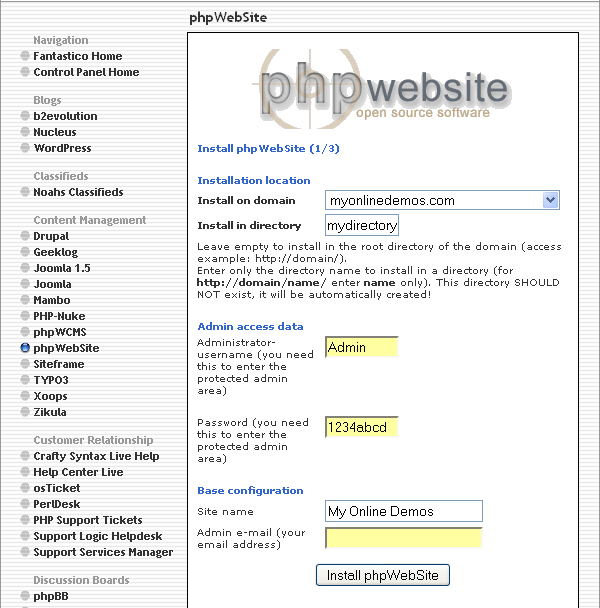 The configuration tools allow administrators to configure the whole phpWebsite site. 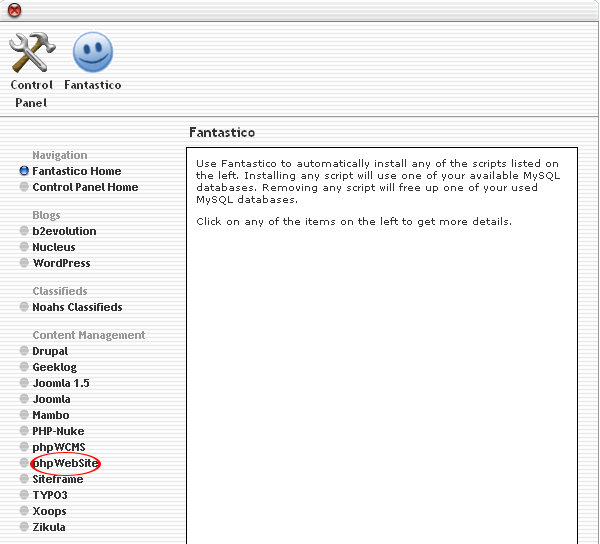 On the homepage of your cPanel, click on the Fantastico icon. This will take you to the home page of Fantastico. Click on php WebSite in the Content Management section on the left Navigation bar. 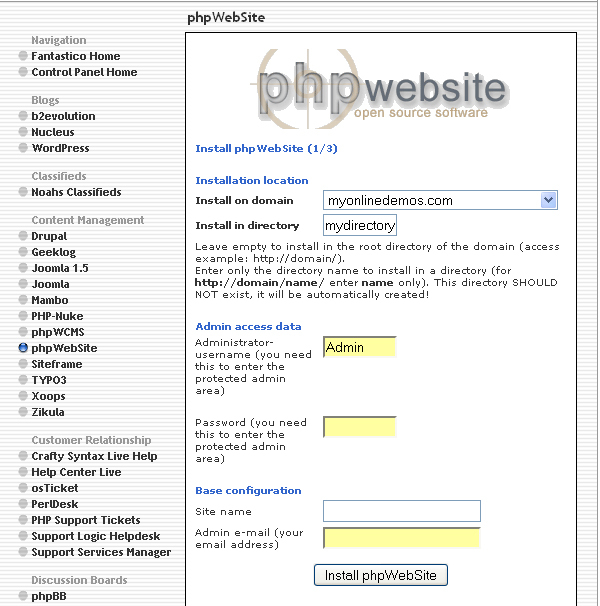 Select the domain on which you want to install php WebSite from the Install on domain drop down menu. 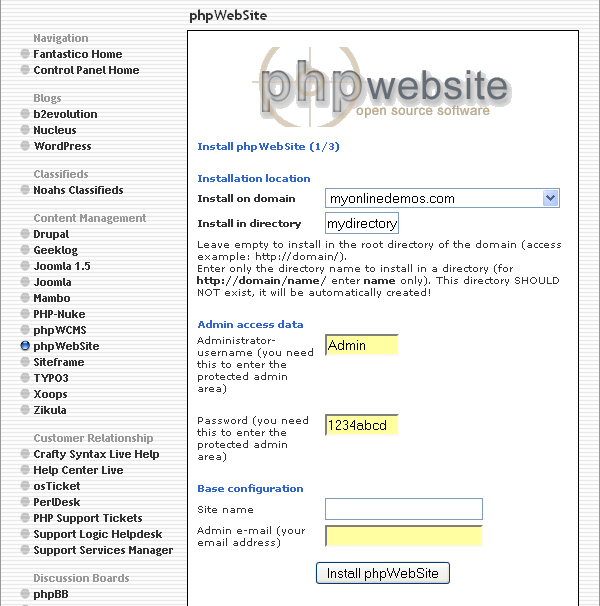 If you want to install php WebSite in the root directory of the domain, leave the Install in directory text box empty. 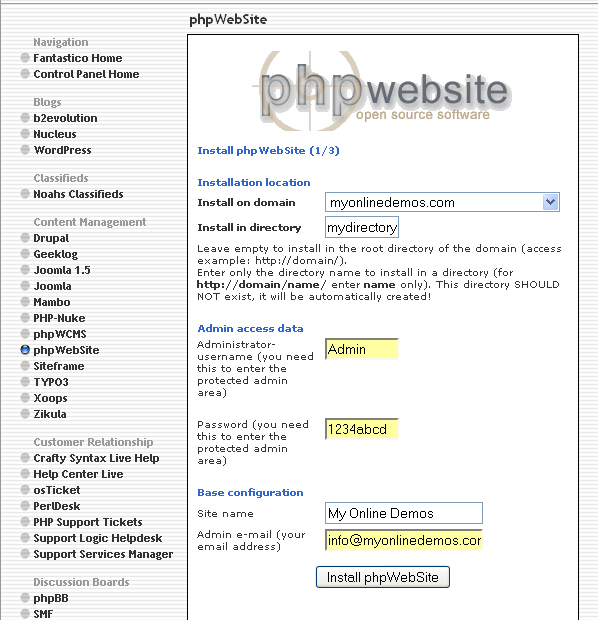 If you want to install php WebSite in a directory, enter the directory name. This directory should not be existed. It will be automatically created. Enter a username in the Administrator-username text box. You need this to enter the php WebSite administration area. Enter a password in the Password text box. You need this to enter the php WebSite administration area. Enter a name for your website in the Site name text box. Enter the site’s contact email address in the Admin e-mail text box. All php WebSite notifications will be sent to this email address. 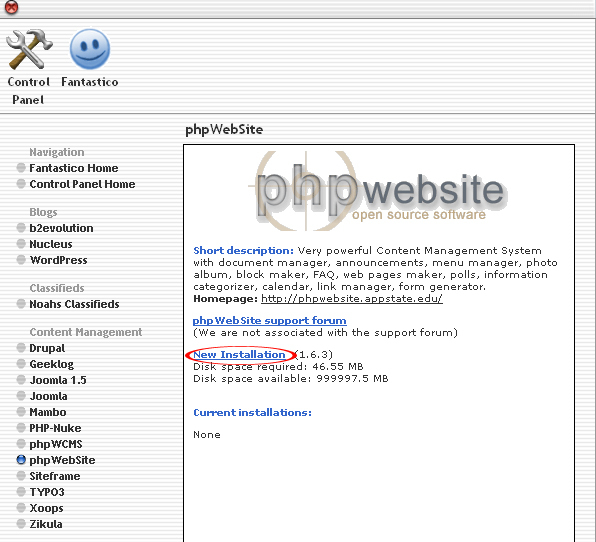 When you are done, click the Install php WebSite button. Click the Finish Installation button. The php WebSite is now successfully installed. If you follow the guidelines above, you will be able to install phpWebsite on your site.